After making potato skins recently, I found myself with most of a 10-pound bag of potatoes left over. That's a lot of potatoes! I made potato focaccia and latkes, but that barely made a dent in my stash. 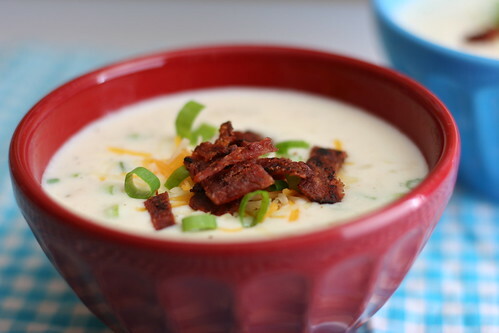 Next on my potatoey to-do list was Baked Potato Soup. This soup is hearty, but not over-the-top-rich like a lot of creamy potato soups can be. It comes from one of my favorite features in Cooking Light magazine, Recipe Makeovers, where traditionally fattening recipes are given a healthy face lift while maintaining flavor. Enjoy! 1. Preheat oven to 400°. Pierce potatoes with a fork; bake at 400° for 1 hour or until tender. Cool. Peel potatoes; coarsely mash. 2. Lightly spoon flour into dry measuring cups; level with a knife. Place flour in a large Dutch oven; gradually add milk, stirring with a whisk until blended. Cook over medium heat until thick and bubbly (about 8 minutes). Add mashed potatoes, 3/4 cup cheese, salt, and 1/2 teaspoon pepper, stirring until cheese melts. Remove from heat. 3. Stir in sour cream and 1/2 cup onions. Cook over low heat 10 minutes or until thoroughly heated (do not boil). Ladle 1 1/2 cups soup into each of 8 bowls. Sprinkle each serving with 1 1/2 teaspoons cheese, 1 1/2 teaspoons onions, and about 1 tablespoon bacon or turkey bacon. Garnish with cracked pepper, if desired. It looks so creamy and comforting! I love it Amy =D. ...looks like a perfect hearty soup to keep on hand for my company this weekend! i love that it's a 'light' version. thanx, amy! My husband would SWOON over this soup and I love that it isn't packed with lots of fat. I've go left over spuds, too, so this just might be dinner tonight! Great way to use potatoes! Great minds think alike! I just posted this the other day. We had it for Christmas Eve. It's so rich and flavorful without being heavy. I will definitely make it again, plus it was super fast to put together. This has been a favorite recipe of mine for years. I've also added a bit of curry powder to the milk mixture too. It makes it taste just like the baked potato soup at a large chain restaurant. I love eating soup in the Winter. I plan on making this soup this week. Thanks for sharing the recipe. This looks hearty and scrumptious! It will certainly become a staple soup on cold winter nights. Thanks for the great recipe! My name is Aimee, I am a social worker and I love to bake. I really like your blog and plan to visit regularly.